The XB Series offers a complete terminal block system with a universal range of accessories. Marking, bridging and testing accessories are standardized across the different clamping technologies—reducing inventory and logistics costs. The modular terminal block design allows for use of the different terminal block types together or individually, providing the highest degree of flexibility. The metal portion of the XB Series terminal blocks are made from highgrade, strain-crack and corrosion-proof copper alloys. They won't experience any electrolytic corrosion or rusting, even when moisture is present. The metal surfaces are protected with a lead-free, galvanic nickel or tin plating. The good electrical conductivity permits only a low temperature rise. The Polyamide 6.6 housings allow for operating temperatures up to 125°C and are certified for inflammability Class V0 in accordance with UL 94. The XB Series terminal blocks are designed to meet worldwide standards and the latest international requirements. All 3 technologies (screw, spring and IDC) use the same bridge system, allowing for individual potential distribution and quickly bridged connections among the same terminal block type or across different types. 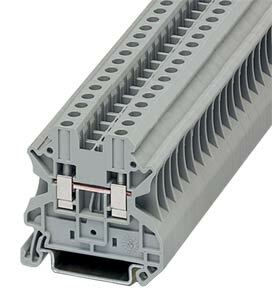 The XB Series terminal blocks have 2 bridge shafts arranged in 1 line, making flexible chain bridging and skip bridging between non-adjacent terminal blocks possible. Plug-in bridges are available from 2 to 50 positions. Reducing bridges are also available to connect a larger terminal block to a smaller one. All XB Series terminal blocks have generously sized surface areas for labeling. This allows for clearly labeled wiring which results in reduced start-up time and simplifies activities such as testing and maintenance. There are provisions for marking individual terminal blocks and end stops, strips of terminal blocks, and large groups of terminal blocks. All test plugs make contact in one of the easily accessible bridge shafts. A 2.3 mm diameter test plug is available for individual measuring wires. Modular test plugs are also available for more advanced testing.